Looking to change IMEI Number of your device due to any reasons? Want to enjoy several loots and take benefits of recharge apps? First of all get to know about IMEI Number (What actually it is?) below. 1 What is an IMEI Number? 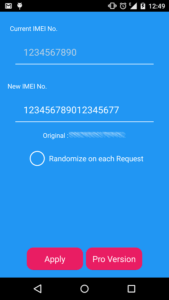 2 Why do you need to change IMEI Number of Android? 4 How to change IMEI Number of Android [Without Root]. 5 How to change your IMEI Number [Video Tutorial]. IMEI stands for International Mobile Equipment Identity which is a Unique Identification or Serial Number of a Mobile or Smartphone. It is normally a 15 digit long number on every smartphone or a mobile which is used to track a device when lost or stolen. You can find IMEI Number of your Device below your battery or phone’s packaging box. Sometimes, we need to change IMEI number of Android phone due to several reasons. There are some benefits of Changing IMEI Number like you can use fake device ID and fake IMEI number of your device for a sake of fooling some recharge apps to get free rewards. Note: Changing your IMEI Number is illegal in many countries. I would advise you to try this at your own risk. PS: This Tutorial is just for Knowledge Purpose, I would not recommend you to try this. Pro Tip: You can check your Android Device’s IMEI Number by dialing [*#06#]. Why do you need to change IMEI Number of Android? …But this is not possible unless you change IMEI Number of your device. These apps store your IMEI Number in their database and when you will try to register another account with the same device, you’ll not be paid money. The best solution to this is changing IMEI Number of your device. There are much more benefits of changing IMEI Number, but always remember these tricks are illegal!! So, try at your own risk. Here, I have provided the step-by-step tutorial for changing IMEI Number on your Android device. But this tutorial requires Rooted Android Device, you can skip this if your device isn’t rooted. Xposed Installer APK. [Download Here]. Before following the steps, download Xposed Installer APK and Xposed IMEI Changer App from the above-given link. Now follow these steps given below. Step #1. This tutorial is for rooted android devices if your phone is not rooted then root it first. Step #2. Dial *#06# on your phone’s keypad, it will show you Original IMEI number of your smartphone. Note it in a Notepad. Step #3. Install IMEI Changer App on your phone. Step #4. 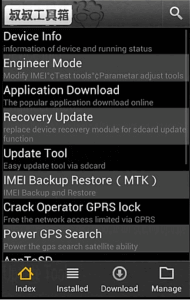 Open Now open Xposed Installer APK and go to modules, then click on click tick mark on IMEI Changer App option. Step #5. Now you need to reboot your device. Step #6. After restarting the device, open IMEI Changer App. It will show you current IMEI Number on your phone. To change it, click on New IMEI Number box and enter your desired number and click on the apply button to save changes. Step #7. Now again reboot your device. Congratulations! If you followed the above-given steps, then your IMEI Number would have been changed successfully. You can confirm it by dialing *#06# (it will show your current IMEI Number). How to change IMEI Number of Android [Without Root]. 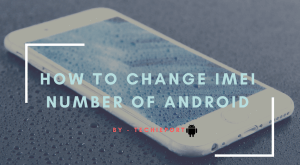 In this part of this article, I’ll show you how you can Change IMEI Number on your Android Phone without rooting your device. …Without Rooting? Yes, it means it is safer than the above tutorial where you needed a rooted Android Device. Step #1. First of all, download Mobile Uncle APK on your Android Phone from here. Step #2. After downloading the APK File, install it on your phone and open it. Step #3. Now Select Engineer > Engineer Mode (MTK) option in the app. Step #4. Scroll down and find CDS Information, then click on it. Step #5. Now click on Radio Information option, it will show you two options in the app called Phone 1 and Phone 2. Step #6. Select Phone 2 option and click on the new option called AT+. Step #7. Now you need to replace AT+ with “AT+(Space) Your New 15 Digit IMEI Number”. Step #8. Click on Send at Command to save your settings. Step #9. To confirm, reboot your device and dial *#6# to check your new IMEI number. Congratulations, you have successfully changed IMEI Number on your Android Device without rooting your phone. How to change your IMEI Number [Video Tutorial]. You can also consider this video tutorial for changing your Android’s IMEI Number without rooting your phone. This tutorial is just for educational purpose. I’m not responsible for any damage caused by this trick/tutorial. Both methods of changing Android’s IMEI Number is 100% working and tested, Try at your own risk! These tricks work without any need of PC, so it’s more easy for a normal Android user. I hope you liked this tutorial. If you feel this was an informative post then do share it with your friends and buddies, So they should also know about this techy stuff. its really very amazing blog site with so much helpful information. thank you very much for writing here for us. Thank you bro. more to come just wait. This is a nice post because IMEI is an important thing related to our phone, and any information about it is always appreciated. How to change IMEI in snapdragon prcessored android without root?